Reverse Target Red, is a hand dyed, hand woven tapestry by Nancy Kozikowski measuring 47x45 inches, woven in 1991. There were three tapestries woven in this series at that time. Reverse Target Blue is in the Renwick Collection at the Smithsonian Museum in Washington D.C. Reverse Target Black is in a private collection in Chicago. 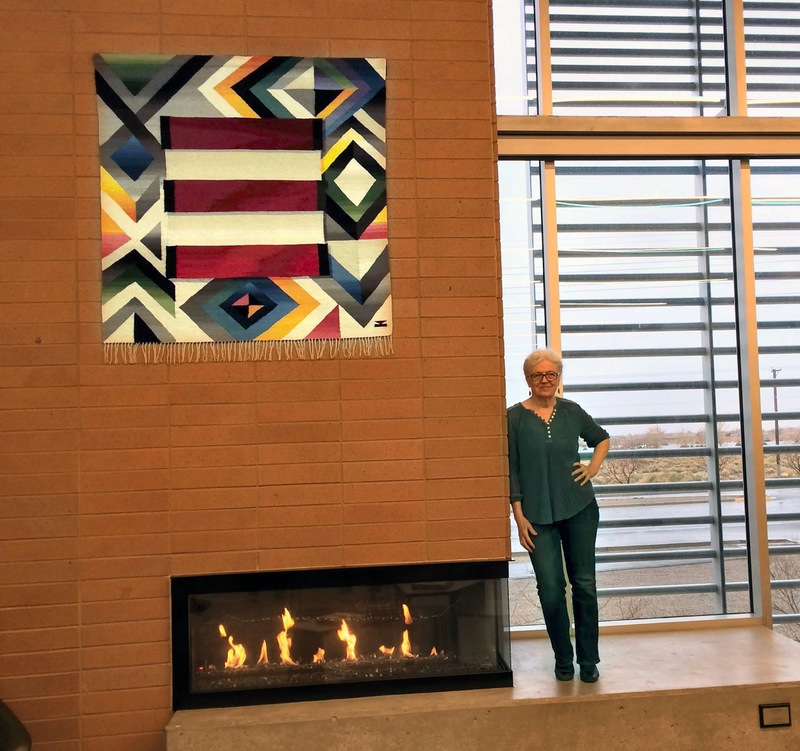 Now Reverse Target Red is in the Albuquerque Public Library at Unser and Central Funded through the Art in Public Places Program of New Mexico Arts, a division of the New Mexico Department of Cultural Affairs. The inspiration for the design for Reverse Target Red began in 1959 when Nancy bought a Guatemalan Huipil from La Plante Gallery in Albuquerque. She didn’t know why but she had to own that garment to study the patterns. She could feel there was a mystery there she wanted to understand. This was unconscious. It was an attraction. It was an expensive piece of art to buy for a high schooler who rarely bought things. This was the first art object she bought. In the 1970’s she bought a Guatemalan Belt at Jackalope pottery in Santa Fe. The Belt reminded her of a flag because it had red and white stripes on one side and multicolored diamond patterns on the reverse. It could be a belt, or these patterns if put it in a different arrangement, could become a flag. She did a design called Guatemalan Flag with red and white stripes like an American Flag with the Guatemalan multicolored diamond patters in place of the stars. How far could you remove a pattern or how many ways could you use it and still insinuate it’s unique history or DNA of the culture. By combining the two she was weaving together patterns of Guatemalan and American culture. 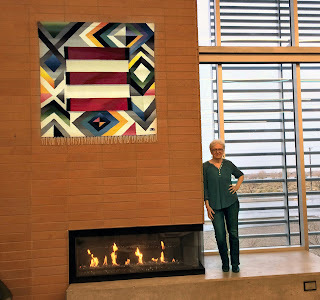 Nancy imagined it as if a Guatemalan weaver saw an American flag and wanted to weave it her way. Then Nancy did a design where she moved the Guatemalan Pattern to a square in the middle of a composition with the stripes in the background called, Guatemalan Target. Nancy evolved the design by moving the Guatemalan patterns to the background, still in bold shallow depth and bringing the stripes forward making a new target image calling it Reverse Target Red. The stripes now as iconographical images with all that stripes imply; stripes signify freedom like the stripes in the American flag representing the original colonies and their relationship with the federal government. Phase One Navajo Rugs are different yet significantly balanced widths of stripes. Navajo rugs got borders when Navajos got borders. Stripes signify freedom. Freedom and open ended connections with past current and future history are a couple of examples of the meaning of stripes. Nancy has made a lifetime study of the theory of patterns, their meaning and how they move through space and time.